“On Sunday, 22nd June 2014 the Berlin Animal Liberation Action (BerTA) protested for the 11th time this year against the airline Air France-KLM, the last passenger airline that transports primates to vivisection laboratories globally. 12 activists called the attention of passengers with banners, leaflets and pictures of suffering animals in laboratories and during the transport. Many passengers took the time to look at the pictures and asked questions. 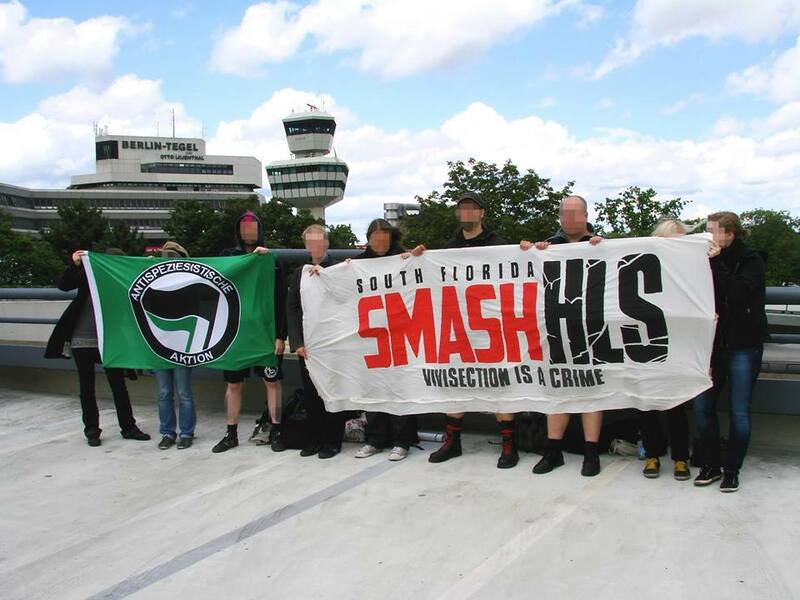 Beside the protest against Air France, the activists wanted to declare their solidarity with South Florida Smash HLS 9 in the US. South Florida Smash HLS is a group founded in 2010 with the aim to end the trade with animals for vivisection laboratories like Huntingdon Life Sciences (HLS). With spying from undercover police, the group has been under massive state surveillance since October 2013 and has consistently been to court since the beginning of 2014. BerTA wants to solidarise with groups like South Florida Smash HLS 9, Blackmail 3 in the UK and other political prisoners. They are not alone in the fight against vivisection.